Although having a 9-5 job is the most common way to make a living, it isn’t the only way. Thanks to the modern marvel we call the internet, there are now dozens of ways to earn extra cash by harnessing an existing talent or developing a new one. Sound crazy? It really isn’t. Thanks to a few part-time jobs and online businesses, my family makes our entire living with the help of two computers and an okay internet connection. And we’re not the only ones. If you conduct a quick search of the internet, you’ll find people earning all kinds of money in ways you never thought possible. If you want to earn some extra cash on the side, consider doing someone’s mundane tasks using a site like TaskRabbit. By signing up directly on the site, you’ll be able to bid on errands that range from dog walking to picking up laundry. The best part is, you can often walk away from the job with cash that day. Got a pile of old textbooks laying around? Here’s your chance to put them to good use. Since some websites aimed at college students make it easy to get cash for used college books, you can earn a bundle just by getting rid of them. If you don’t want to list your books on an online book resale site, you can also list them on Craigslist.org or on your local neighborhood Facebook page. If you’re a decent writer and want to earn some extra cash, you can always consider freelance writing on the side. If you have a career focus or are an expert in your field, you should have no trouble getting writing jobs. Although freelance writing is highly competitive, I don’t feel weird suggesting this strategy to others at all. The truth is, there are a multitude of jobs out there for anyone with a unique voice. Want to learn more? If you aren’t a great writer but have other online skills, you should be able to find work as a virtual assistant. In most cases, VAs perform tasks that writers and website owners don’t have time to do. Those tasks typically include things like making Pinterest images, answering and composing emails, writing and scheduling blog posts, and performing other administrative tasks. If you’re on the internet often, you can probably earn a bundle by installing a paid search engine like Swagbucks.com. After you install the tool bar, you’ll earn gift cards just for using your computer for everyday tasks. As of today, Swagbucks has paid out $96,778,619 in gift card rewards, and all to people who did nothing but use their computers like they normally would. Although the internet has made life harder in some ways, it has also opened the door to a wide range of new careers. A few decades ago, none of the side gigs listed above were possible – or even feasible. But with the help of the internet, the ways to earn extra cash are practically endless. What is your favorite way to earn money online? Have you tried any of the strategies above? I’ve tried to sell my old textbooks, but they’re so out of date nobody wants them, haha. I have a friend with a math curriculum degree and I was showing her all the online listings for people with her credentials. She was super excited but a month later hasn’t applied for anything. I think you can find all sorts of online ways to make money, but you also have to jump quickly or you’ll miss out to one of those more motivated people. I still need to remember to use Swagbucks too. Maybe I’m as bad as my friend! I recently started using Izea, you can can paid for tweets, blogs posts, etc. A lot of big companies, recently got paid from 3M and Char-Broil for sponsored tweets. I had a little heart flutter when I saw the ‘Sell Your Books’ heading… That’s like asking me to sell my cats! Oops, I guess I should have said daughter. 🙂 Then I saw it was text books. Phew! I haven’t had any of those in a long time but my daughter (uni student) has stacks of them lying around. Time to find an avenue for sending those door stops to new owners! Might have to do some googling for that one as I’m not sure if there are dedicated sites here in Aus. Right now blogging is my favorite way to earn money online but I\’ve used Swagbucks before with great success. There really is a lot of opportunity out there, especially if you’re willing to put in the work and effort to do it. Even if you don’t there are plenty of other options that’ll get you a little cash. I think the fastest way is to just asks friends if they need any kind of help: babysitting, pet sitting, cleaning, errands, etc. I have gotten more side jobs that way but just putting it out there, then be willing to do just about anything…legal of course. lol! I make some extra cash freelance writing. It’s good because I get paid while building my portfolio. Great list! Great ideas! I’m looking for more VA work since it gives my brain a break from writing and we’ve also been using the search bar feature to earn extra Swag Bucks. I earned quite a few Swag Bucks from shopping and doing free trials last year so I’m hoping I can pick it up a bit to earn some more to utilize around Christmastime. I really want to get into freelance writing; seems like such a fun way to make extra money. Having a hard time finding opportunities though, but will check out the link you posted. Thanks for the ideas! I can’t help but go back to the whole donate plasma approach. It seems like such an easy way to make extra cash, and you truly can make it ASAP. 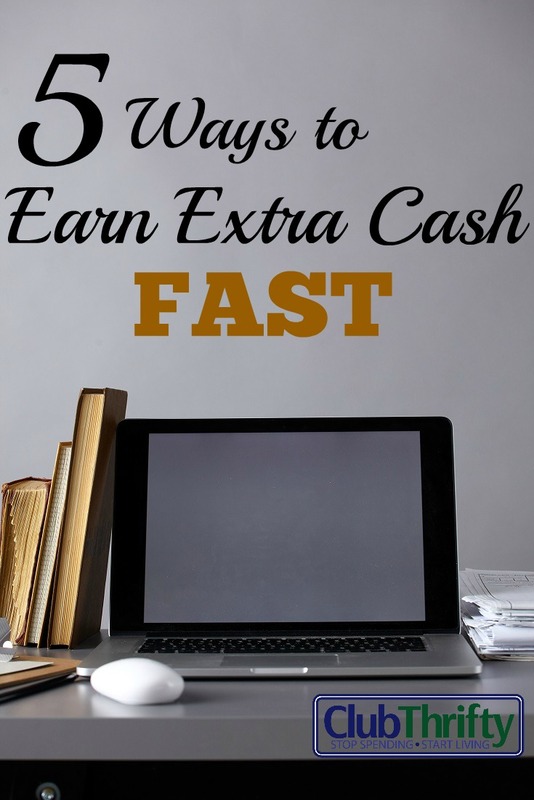 There are definitely lots of ways to earn some fast cash (legally, of course!) that many people overlook. Like Tonya mentioned, just letting know friends know you’re available to help out, can be one of the quickest ways to land a few babysitting, housesitting, running errands kind of jobs and I suspect they even pay better than jobs where you have to bid. Another idea is house cleaning on the side. A friend of mine just started a small house cleaning company and is getting tons of calls, and the rates are surprisingly high. I think hiring yourself out as a virtual assistant is an awesome job. I think there is a growing need for that type of service and a someone who recently hired my own, I have to say that it’s money well spent. My husband loves writing text book answers for slader.com . Once the answers are in there, they keep generating money, so it’s great! One of the best side summer gigs I had was private swim lessons. Parents pay big bucks for this. I used to lifeguard and be a swim instructor in my younger years for the city. Thank you for the reminder — I’ve got a stack of books sitting at home that I need to try and sell! I’ve been putting it off for the same reason most of us put off anything.. I’ve never done it before and know I need to look into the process (of selling on Amazon, for example). Would be well worth the 5 minutes that would take, though 😉 It’s officially on my to-do list now! My wife makes extra money by giving cello lessons. My side gig is rental real estate. Most of my tax clients are not local. That would have been much less convenient to do pre-internet. I’m opening a jewelry store on Etsy – Natalie Lane Shop! That is my newest side hustle income adventure. My first love is finance, and part of that means hustling to pay off this pesky student loan debt! Great list. I haven’t heard of TaskRabbit so I might check that out. After all the work and chores I just did around my house the past few weeks I may use it for some help myself. I found some luck with selling old textbooks. My husband did an engineering and business degree so a lot of his books were quite expensive and surprisingly a lot of his still held value (I say surprisingly because we have been out of university for almost 10 years). I would say, I was able to sell about 1/2 of our textbooks and the other half I was able to donate to the local reference library. I used a textbook resale site and it was surprisingly easy. These are all great ideas when it comes to making some fast cash. We have made some side cash selling many of the things sitting in our house unused. You would be surprised at the amount of clutter you try to store away and never look at again. Try selling the clutter on craigslist, ebay, garage sale, or facebook. Eliminating clutter means lease storage need and eventually a smaller home which saves you money yet again!